While traveling along the Labrador Coastal Drive in Southern Labrador, Canada, one can stop and overlook the landscape and the beauty of the Pinware River Gorge. Along the river, powerful rapids make their way through the gorge where either side of the banks are a reddish brown in color. This colorful landscape is made up of quartz which formed during the Proterozoic Era as the river plowed its way through the wilderness finally forming this gorge. This river can be extremely dangerous and unforgiven, one that separated communities from each other for many years. In 1965, a bridge was built and people from various communities could easily cross over the Pinware River Gorge without facing any danger. 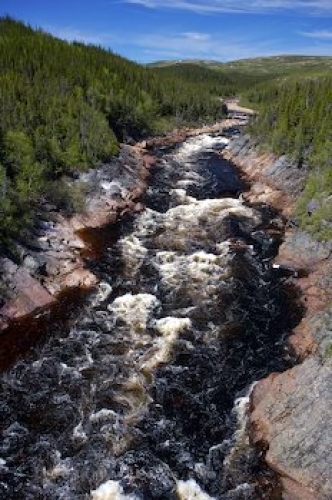 It is amazing what the powerful forces of nature can create and when standing above the Pinware River Gorge along the Labrador Coastal Drive, the roar of the water can be heard. A beautiful scenic area which is amazing to see while visiting Southern Labrador, Canada. Picture of the landscape and river at the Pinware River Gorge in Southern Labrador, Canada.